Ethiopian Biodiversity Institute » Blog Archive » The Use of Microbial Technology Plays An Important Role In The Attainment of Food Security. The Use of Microbial Technology Plays An Important Role In The Attainment of Food Security. by Kehali Dereje ~ May 30th, 2018. Filed under: Latest News. The 4th annual conference of Ethiopian society for microbiology was held in Bishoftu for two days, May 25-26, 2018. The conferenece focuses on the theme: “Microbial technology and Food Security in Ethiopia”, emphasizing the importance of technology to ensure the guarantee of food security. The president of the society, prof. Ketema Bacha, said that research carried out on micro-organism with the help of technology is a viable alternative to sustainable food security. Micro-organism helps to fertile soil of the agricultural field as well helps to increase productivity by eliminating waste, he said. He also added that the society is working to bring relevant stakeholders through a platform to diversify findings by members of society into the community. 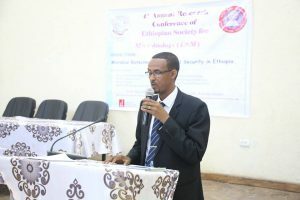 Vice President of the Society, Dr. Genene Tefera, on his part said the microbes are of equaly importance to other biodiversity assets, but there is a gap in technological innovation. He mentioned that research carried out through Ethiopian Biodiversity Institute has identified the different types of microorganisms that contribute to improve soil fertility, food security, and accelerated plant growth. Developing technological capacity to address these research findings effective for society requires due attention, Dr Genene pointed out. Prof Fekadu Regasa, on behalf of the Veterinary College at Addis Ababa University, emphasizes that the proper management of micro-organism technology should be taken into account, since the international community is concerned with biotechnology. On the conference research papers were presented related to the theme and discussed with stakeholders. Ethiopian Society for Microbiology established in 2014.